Food. If I could eat for a living, I definitely would. I love trying out new recipes in my kitchen, but more than that I absolutely love eating out at restaurants and hotels. I love even simple things like reading through the menu and getting the feel of a place. When I visited London I remember that every day I went on a mini adventure, whether it be to an art gallery or a museum I made sure to try out a new meal, flavour, or drink at every location. If a food stall was offering samples and taste tests best believe I was on it. So being in Cape Town right now it is only natural that I would hunt for food at places I have never been to before. 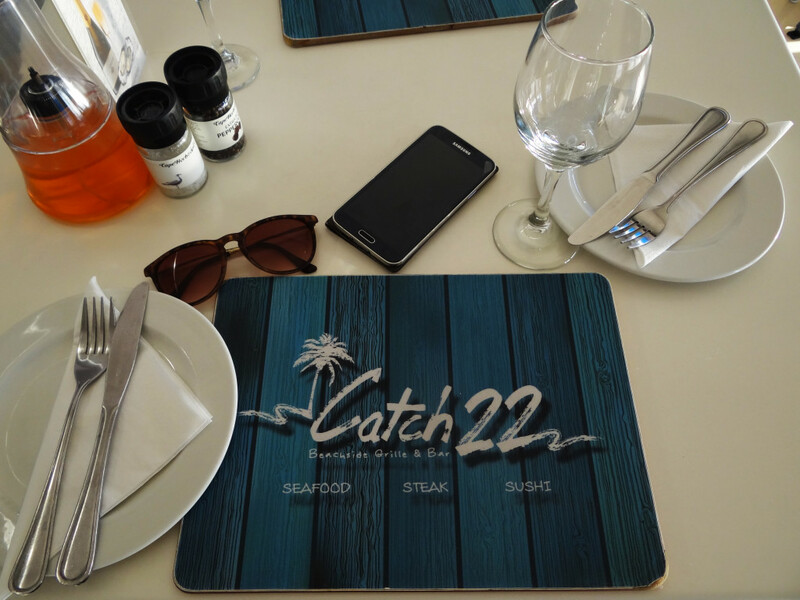 Catch22 is perfectly located on the corner of Portfield Road and Beach Boulevard along the Blouberg Beachfront. The website claims that the restaurant offers friendly hospitality and breath-taking views and offers an enjoyable, relaxed, linger-longer atmosphere. And it does exactly that. We were greeted by extremely friendly smiles (by whom I presume was the owner) and were immediately lead to our table by a bubbly young waitress. 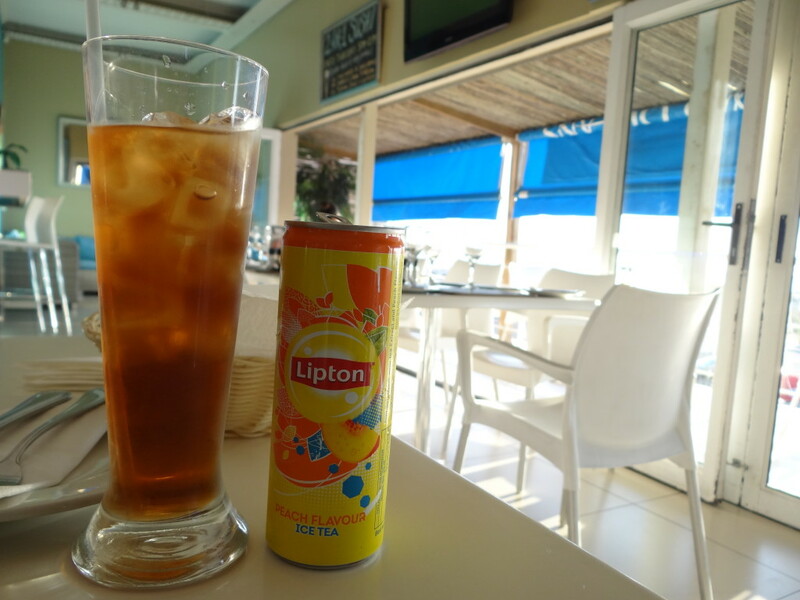 It was extremely hot on Monday (34 degrees) and even though we took our time trying to decide whether we wanted a table inside or outside the waitress’ smile never faded not one bit. 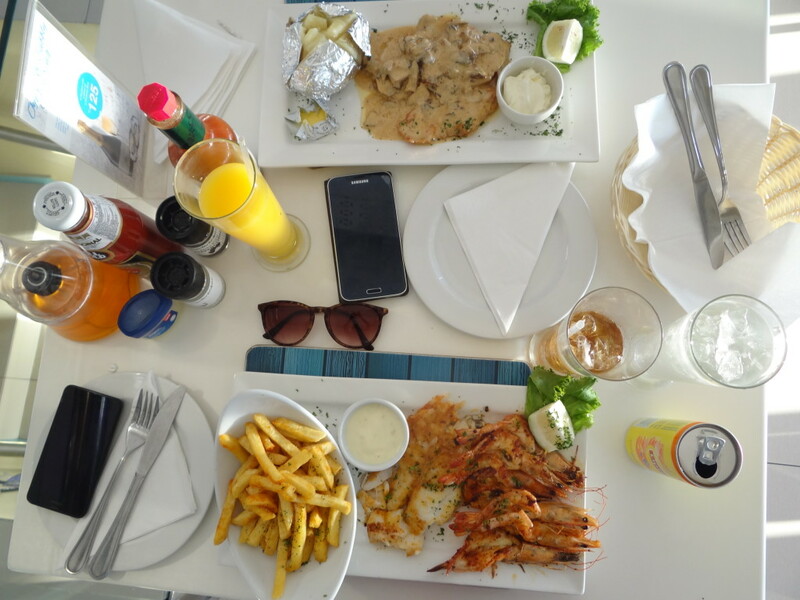 I ordered the O-Fish-Shell meal, which is an extremely filling meal that comes with hake, six decent-sized prawns, tartar sauce and a side of your choice (you can choose among chips, rice or baked potato). I chose to go with the usual side of chips. If you’re a light eater and are there with a friend then this is a meal I would highly suggest sharing. I couldn’t quite manage finishing neither the side of fries nor the extra water I had ordered on top of my go-to Lipton Ice Tea (peach, of course). My mother ordered the Chicken Newburg which is yet another hearty meal that comes with pan-fried chicken breast bathed in a sherry and mushroom cream sauce and a side of your choice. She also could not finish her meal and I would suggest yet again that if you are a light eater, have this one to share. The service was impeccable. Our food arrived before we started fidgeting in our seats and considering the restaurant was starting to get a little packed with customers this was a major plus. The food was beyond amazing, and the tartar sauce was the best I have ever had. Being a person who believes that fish should always be accompanied by tartar sauce this says a lot. The fish was cooked to perfection and was literally crumbling as soon as I lay my fork on it. It was spiced just right and the chips also had the right balance of spiciness. They were not too plain, but the spice, which looked like it may have been too much, tasted anything but. The atmosphere was alive and kicking and you could tell from the crowd of people that were entering as we were leaving that people were ready to have a great meal and a great chilled time. All in all the experience was definitely worth getting out the house for on such a blazing hot day. This is one restaurant I would suggest you visit if you live in Cape Town but haven’t already, or at least one to pass by and have a little meal in if you ever find yourself in that part of the Western Cape. And plus, the location makes for an incredible view of the sunset. 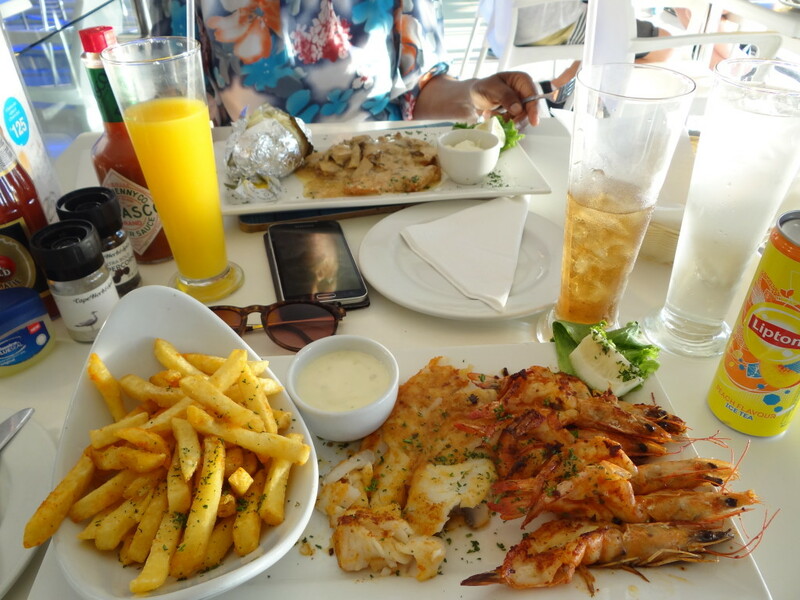 What is you favourite Cape Town restaurant? I would love to visit it! 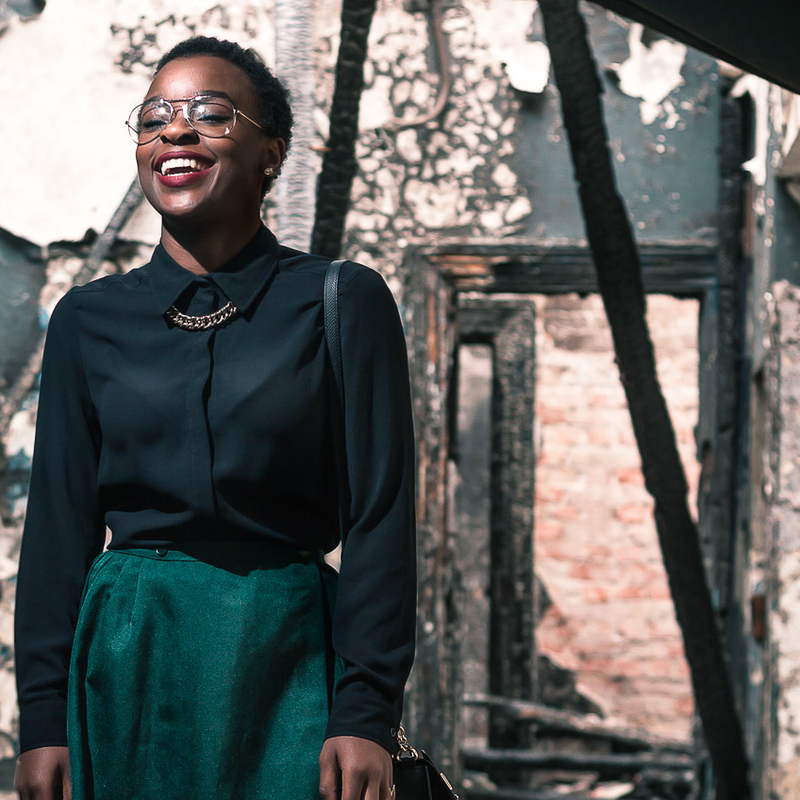 Next Post TREND TUESDAY | Has the Skinny Jean Era Come To An End?